How hard can it be to find an hour on a quiet Sunday when I'm on my own? Luckily I didn't need a full hour. "Ahh, Bugler, there you are! Sound assembly!". 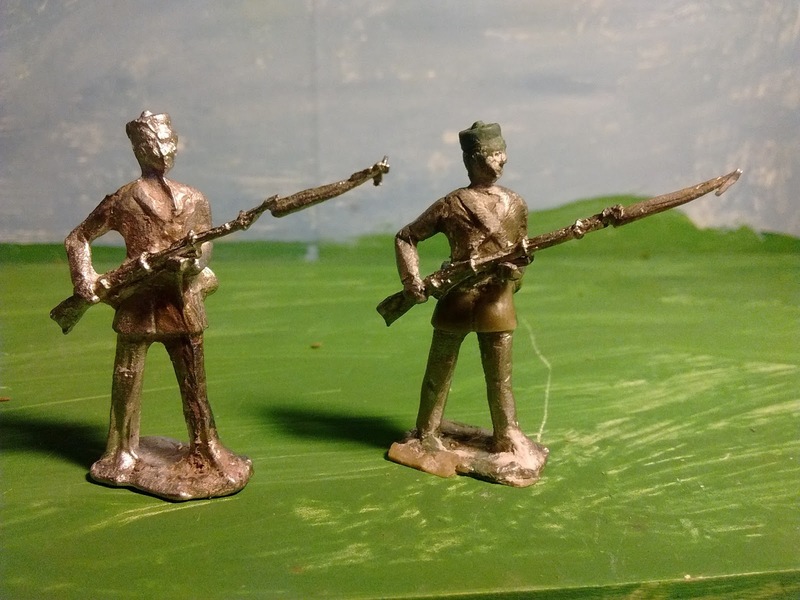 The last figure of the last batch was demoulded too quickly and lost his rifle. Rather than wait till the today's casting session, I trimmed him up then took a spare trumpeter arm from a Zinnbrigade British Dragoon mold, shortened the trumpet and have passed it off as a toy bugle. 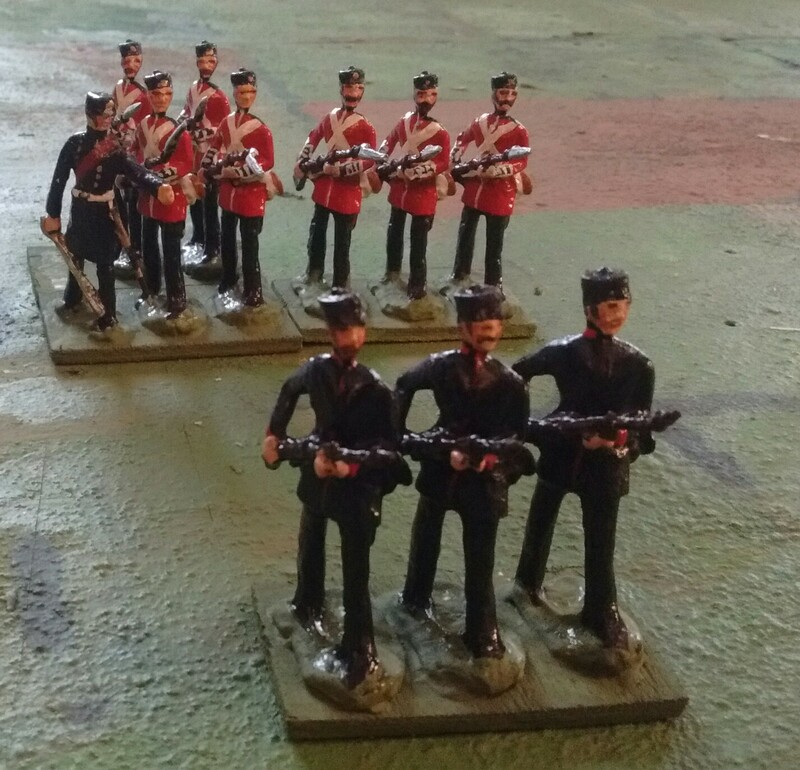 The 2nd new unit is now painted up as Victoria Rifles c 1860 and the 3rd unit is cast and waiting to be deflashed and primed. They can be seen below standing in front of their bible, an 1861 manual that I picked up at an antique book stall in Kingston during the summer of '76 when I accompanied Doc Ruddy to a conference of military museum curators and historians. (I was cadet curator of the Fort St Jean museum under him). The manual covers everything from basic drill, to how to teach yourself to estimate distances and the room needed to deploy X number of men, to battalion tactics, to manouevering brigades and divisions and more. I was expecting to play a test game today but as I was starting to set up yesterday I realized that I've had enough test games with motley collections of various stand-in figures as I hesitate over periods and rules options. My attempts to avoid focusing on the area of greatest interest in favour of trying to do a bit of all main interests have (predictably but not inevitably) failed and its time to just accept and get on with it. (This is not to say that I have just 1 period/collection now, merely that all those outside the mid 19thC era are relegated to secondary with as many as possible being of the "game in a box" sort. Therefore, I took the rest of yesterday's hobbyroom time to paint up more figures and spent part of my pack (ie family) time browsing old blog posts (aided by the occasional nose or paw). As suspected, every one of my recent rules ideas, issues and options has already been thought of within the last 3 years and put to the test. A few ideas and options have been rejected, others remain as valid options of the "you pays your money and takes your choice" sort. The Volunteer "Brigade". Should be ready by Monday. One of those rules options is the frequent flip flop between making combat modifiers for things like cover an absolute advantage, by dropping dice or halving casualties, or a relative one, by modifying dice scores. 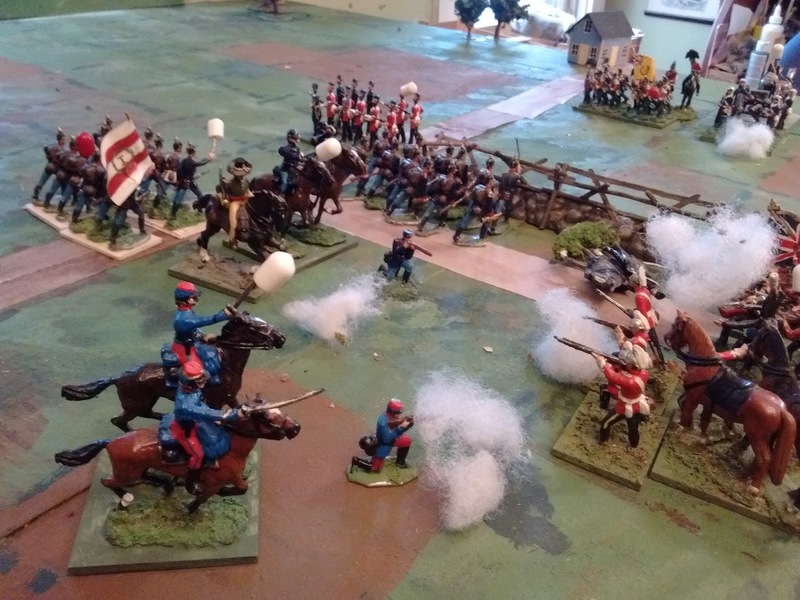 The first favours the defender and is probably a more accurate reflection of history, certainly it stems back at least as far as the original 19thC Kriegspiel but, it really requires a system that allows for more than 1 hit, preferably something that allows lots of hits, like Charge! and it tends to be both slower and more predictable. Adjusting the die score is faster to play and works better with small numbers of dice though larger numbers of dice are still better. The deciding factor from a game POV though is that the die modifier route is less predictable and can lead to quick, unexpected or at least low probability results thus heightening tension and excitement while forcing a player to be always prepared for the unexpected. That is the route I am going. The 2nd issue resolves around the questions of "what is a unit? ", "can it be split mid game or spread across multiple grid squares and later be reformed?" and "do unit formations need to be shown during this era or can they assumed?" Once again the answers are "it depends what you want to do". To give a basic example, a battalion could vary from say 300 up to 750 or more men (conveniently rounded numbers) and thus have a frontage between 100 up to 250 yards in line. By 1860 any where from 1/2 to none of it might be deployed as skirmishers and supports up to 400 yards in front of it. The weapon ranges I use suggest an average of 150 yds per square give or take 50 so a battalion could occupy anywhere from 1 square to an area 2 squares wide and 3 deep! Do I want to go there? Absolutely not. My answer becomes a practical game one with some historical justification. Firstly, large battalions were sometimes split or small ones used together so standard units are quite acceptable to me. Secondly while the theory was that each battalion would provide its own skirmishers and supports and that the skirmishers would rejoin the rest of the battalion when the armies closed, memoirs and the like suggest that the skirmishers would often not rejoin till the fight was over and it seems that it was not uncommon for one battalion to be designated as providing the skirmish line and close supports leaving the rest of the brigade formed. Since I want permanent "units" for campaign and narrative purposes, I am going back to the way the square brigadier handled things stretching back towards MacDuff. The basic infantry unit will be a "company" (2 stands of 3 figures but anything will do). In theory 4 of these will form a "Regiment" for organizational and historical purposes but any number of them plus a "General" will form a Brigade. However at the start of the game or upon arrival as reinforcements, any infantry company may be replaced by 2 units of Skirmishers. These may not be reformed during the game. The infantry companies can be stacked 2 to a square in clear terrain. If all goes smoothly, I will spend tomorrow working on figures and will play a small game on Sunday. Oberberg and Atlantican native forces aren't really ready to take the field yet so the game will again be an Oberhilse vs Faraway clash. Today, for the 1st time, the Martians were not just stopped but were routed by forces under General Ron. The new Heavy Artillery is being given much of the credit for today's victory. 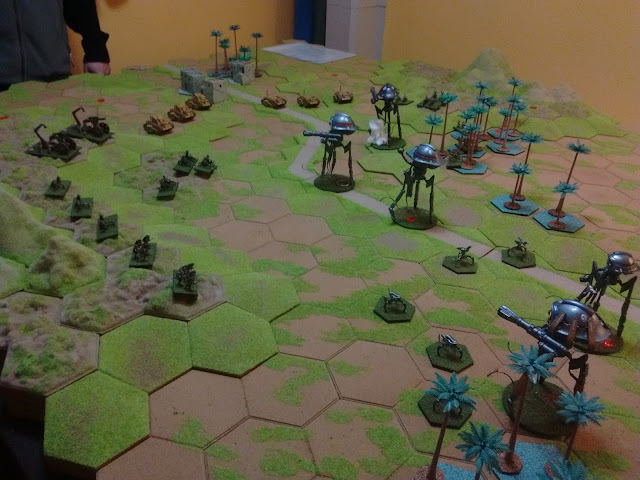 The Martians entered the Porter Valley with a powerful strike force of 5 Assault Tripods backed by 2 weaker drone control tripods each with 3 drones. 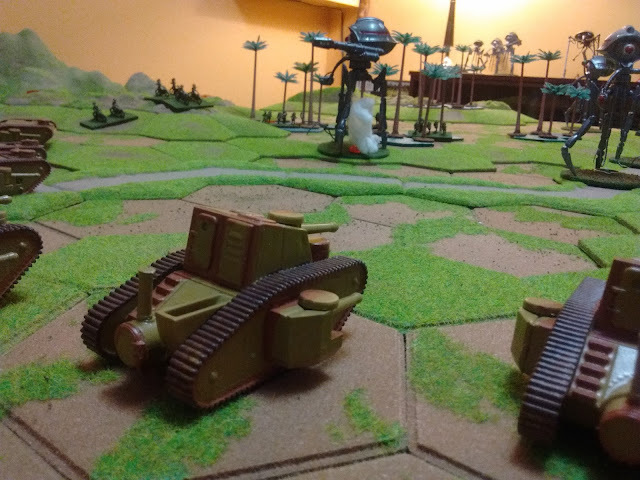 A dastardly.....oops...I mean.. deadly ... barrage by a new battery of heavy guns took out 1 of the control droids before the Martians even deployed onto the field of battle. Overview from behind Martian lines, 1/2 way through the game. This may have rattled the Martian Commander more than he realized or would care to admit as his reaction to an aggressive forward ambush was not as effective as one might have expected. Of course, even a clumsy plan might have sufficed if even 1 of the 5 human units that suffered losses had failed a morale check or if the remnant of the heavy artillery hadn't blown up the 2nd drone controller before the drones could engage. 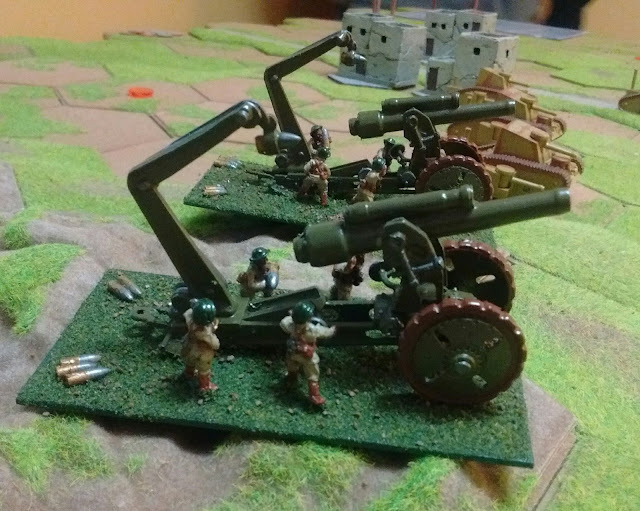 However, an early appreciation of the value of using terrain to shield his weaker drone control tripods from the fire of the new artillery might have led him to stick to his original plan of clearing the woods on the right and locating the enemy before pushing forward. 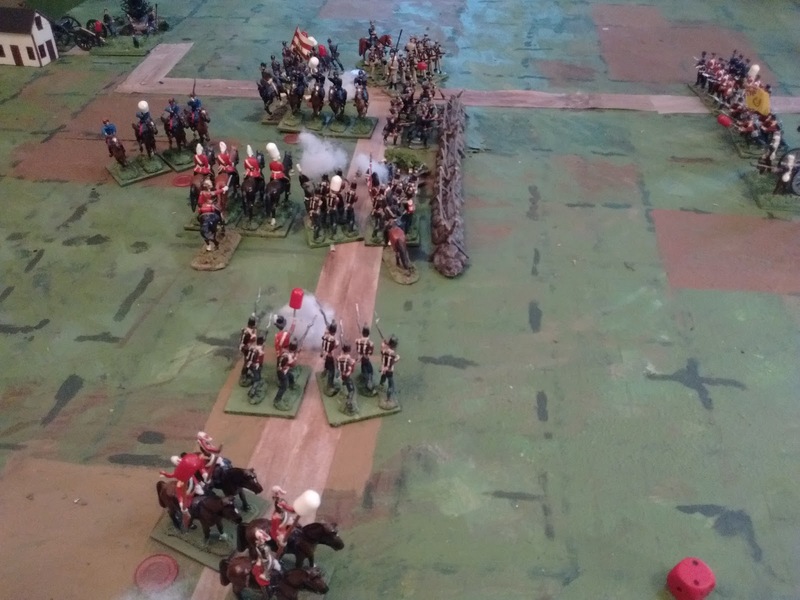 A blind rush at the artillery was certainly not part of the plan. In any event, communications experts claim to have intercepted a signal from the retreating Martian leader which roughly translates to "I'll be back". Today went a bit sideways so I didn't finish setting up a game but I did get my little fortified post refurbished and enhanced with cabins, firesteps and a gate. Newly landed in the Kapelle District, Faraway volunteers drill while pioneers work on a new frontier outpost. Atlantican scouts look on from a nearby hill. The focus for this campaign has been wandering in uneven fashion over more than a decade. Those who are really bored or curious can trace its path through past posts and I have been working on a post to set the scene for the upcoming 5 years of campaigns so let me get to the point. 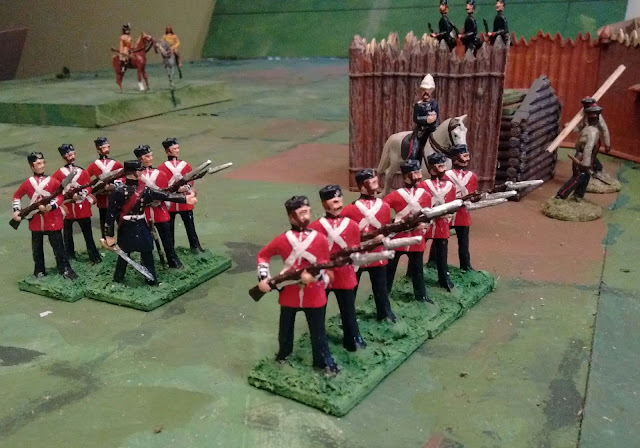 I mentioned a post or 2 ago that I was fairly happy with where the rules were going for the traditional division sized wargame but that I wasn't sure how well they would work for some of the "Colonial" style games. 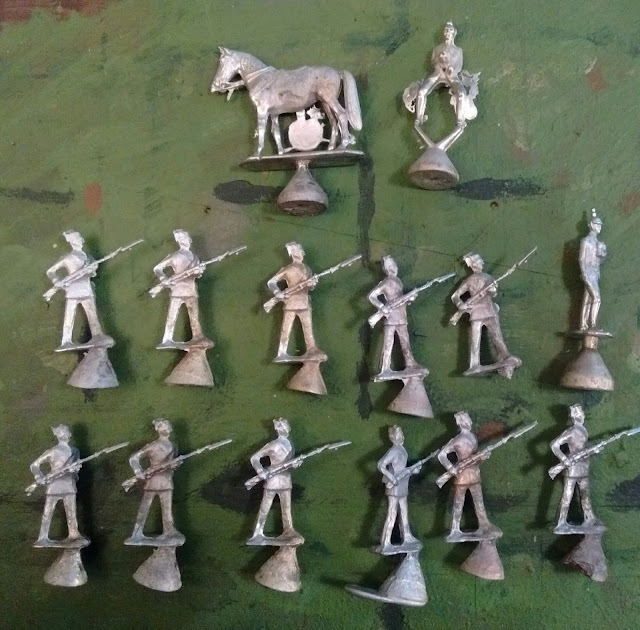 I was a little concerned over duplication with my 1/72nd ACW armies but brushed it aside. What I forgot to cross reference was what my plans were for the 40mm Atlantica figures that I was painting. In short there were to be 3 overlapping and interrelated wars. A minor border war south of the Mountains, and 2 Colonial campaigns, the first Oerberg war, a largely which saw the establishment of a recognized independent state and the great Kapelle Rebellion that I've been working towards for a decade now. None of these campaigns call for much in the way of big pitched battles between conventional forces, at least not soon though the Rebellion has the potential to go there eventually if Qyuqoit gets involved. That's why the plan was supposed to be to relegate those sorts of games to the ACW! The work on the Model Major General wasn't wasted but those rules will be used for the ACW. That's why I was trying to work on the Tin Army which was used for the the first of the Kapelle battles last June. So, back to something more like a smaller, simpler, gridded version of MacDuff if you like. Company sized units (6 figures) normally fighting as skirmishers and supports but occasionally forming with 2 companies in close order in a grid area (dense mobs for native spearmen when they arrive), This lower level should also allow me to resurrect my larger buildings which have been staring mournfully (if not accusingly) at me from a shelf. The next game will involve an outpost under siege with a relief train on its way. 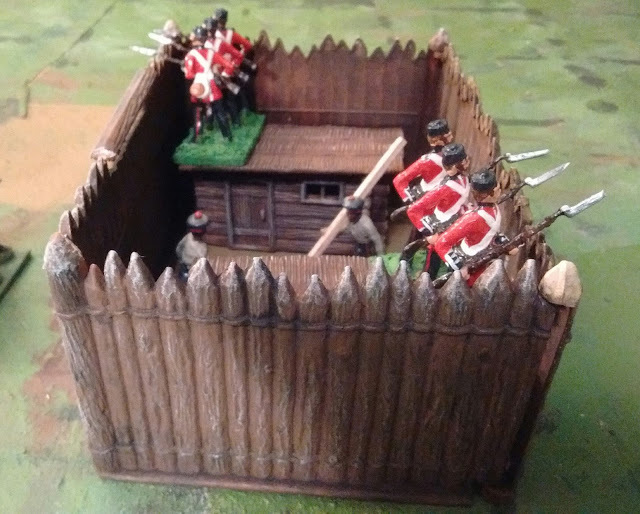 This afternoon the prefab fort (originally Marx jungle stockade) has been undergoing adaptation and improvement to fit better on the grid and provide accommodation for a small garrison. It fits quite well on 3x3 squares at the moment with separate cabins but no walkway but thats waaaaaay to big to be held by a company or 2. I'm hoping to have the table ready by Monday night. I was half expecting the Newport Noodle to cover this little engagement but apparently no reporters were available or paying attention or there was free coffee on offer somewhere. Just as well since this'll give me time to straighten out the back story, maps, troops etc and get ready for a small but proper campaign. 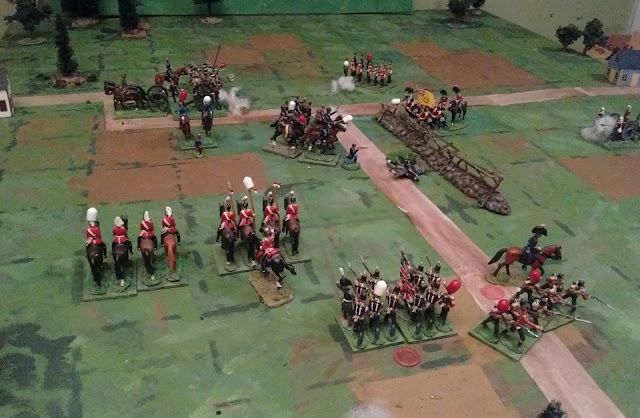 The scenario was a traditional equal forces encounter, General, 2 cavalry+brigadier, 4 infantry+brigadier, 1 gun. Both sides entered already deployed, both with orders to seize the crossroad and stonewall. I placed the infantry in the center and diced for the cavalry and guns with a 50% chance of left or right for each. All troops were average. Red is formed up on the Northern side of the table. There was an initial rush forward all along the line apart from Blue's cavalry being sent on a wild goose chase to check out the woods by the window thanks to a chance card. Fortune played no favourites though and soon granted Blue a 1 area bonus move allowing them to reach the wall ahead of Red. 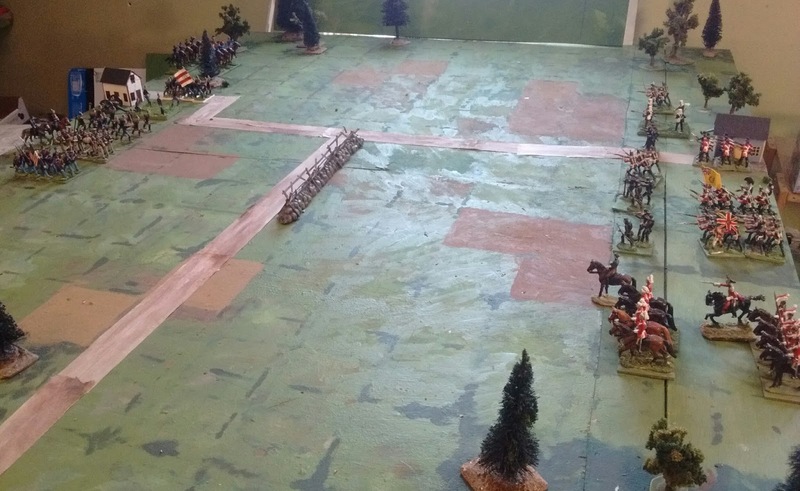 Red's subsequent assault was repulsed all along the line but Blue's flank was overlapped and a combined infantry and cavalry assault over ran Blue 1st Infantry. On the Western flank Blue's artillery managed to drive back Red's battery and the threat of a flanking move by cavalry induced the new Brooklyn volunteers to fall back with them on the initiative of the battalion commander. For a moment I thought the axis of the battle lines would both shift 90 degrees but Blue's right looked more exposed despite the Oerberg Volunteers forming square so I diced for options and Blue's cavalry came galloping back while Red rallied his infantry and the opposing lines skirmished. 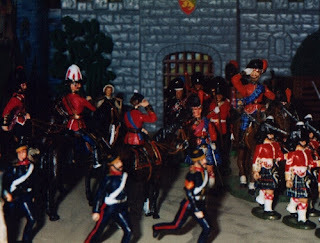 It looked like the game was about finished but Blue's cavalry had now come galloping up. 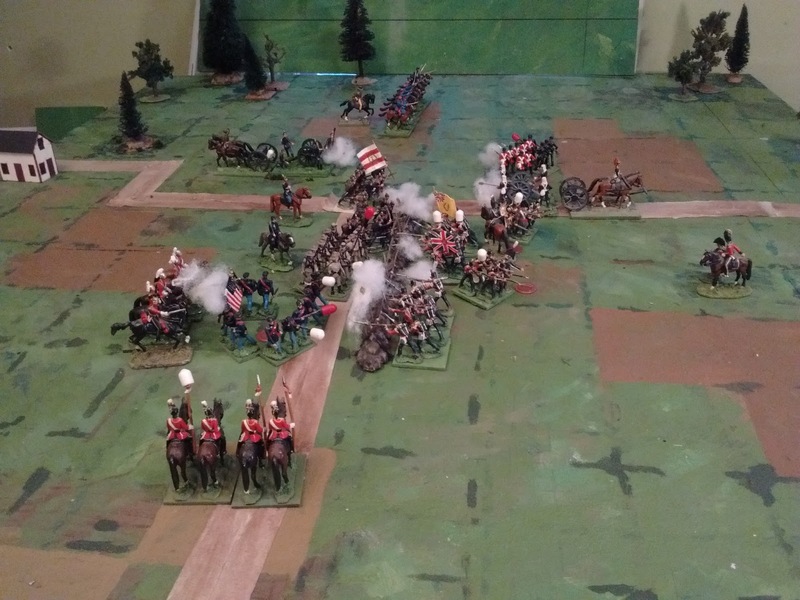 A brief, indecisive mounted clash and mounting casualties saw Red falling back slightly and dismounting. Blue pondered the options (ie diced for them) and decided to follow suit. A protracted firefight resulted all along the lines which intensified as Blue's artillery and some rallied infantry moved back into line. In the end, it became a slow grind of firefights between battered units and Red's growing numerical superiority continued to tip the balance until Blue's army morale collapsed as a 3rd and then 4th unit broke with only 1 Red unit being too badly shot up to rally. When I once again started planning a single framework for everything from skirmishes between a few units and battles with as many troops as my table will hold, I thought I needed to go back to something that would allow me to break units up mid game but once again that caused unwelcome rule alterations that broke many of the things that were working. I pondered the question between games and realized that all I needed was a way to break down units before a game. In other words the ability to have full units and detachments so that I could have a small outpost or man an armoured car. That resolved that. 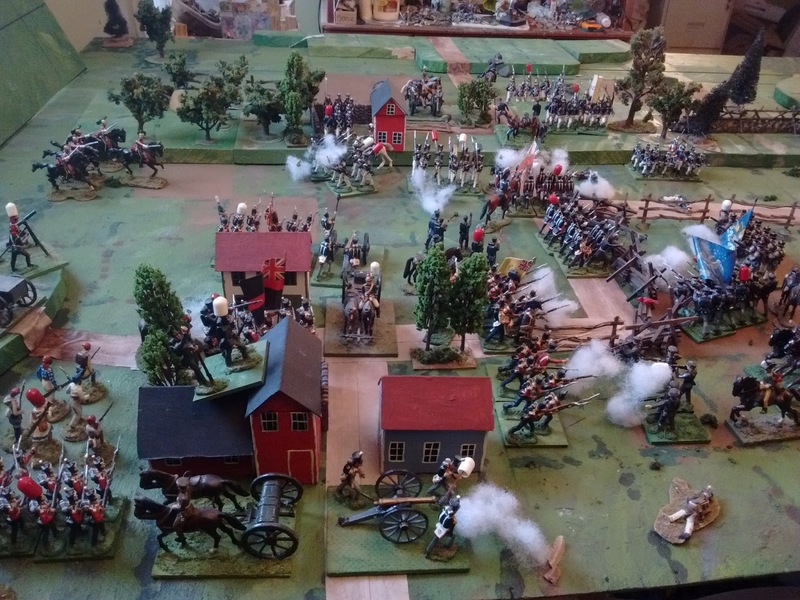 I also decided that I liked the system of a joint preliminary artillery and skirmisher fire phase followed by alternate player moves each with a close combat resolution such as I tried in the Dec 2014 Gettysburg games. It needs some adjustment but I am happy with the feel of it. The big issue right now is getting just the right balance of combat effects and morale, temporary and permanent. Its a very delicate balance made worse by awareness of scale and detail in a set of rules that are supposed to be showing intention and outcome rather than process. For example, in order to fit a battalion into one area and fit the kind of battlefields that I want onto my table, I have had to adopt a ground scale of roughly 150 yds per area and around 450 men per battalion, stretching or compressing it to 200 yds for bigger battles or 100 yds for smaller ones. Initially I once again tried detaching stands of skirmishers so fire could be seen to be relative to the positions of the skirmishers but since a skirmish line is not separate from its parent unit that gave me the added complication of units occupying 2 areas (or 3 if I pushed it to theoretical limits). Easy enough when they stand still but a real headache when they start manoeuvring, esp in a bigger battle Manageable if I relied on "feel" rather than a rule but it really detracted from the pace and feel of the game without really adding anything other than to encourage unhelpful thoughts like "this sort of detail would be easier if I were using 24 or 48 man units on an ungridded table with a ground scale closer to 1"=10 yards". Really though, I am striving towards an effects based game which assumes that unit commanders rather than the player-general is managing the details of unit tactics. This means some hard choices about letting go of 1:1 relationships and a lot of details. For instance, if a unit is firing at 3 area range does that mean they are shooting at a target which is 450 yds away? This is within theoretical maximum range for aimed shots by well trained troops but beyond normal effective battle range. Or, if the units are both formed and at the back of their respective areas are they actually nearer to 600 yards apart? Or do they each have advanced skirmish screens firing at each other at 100 yards somewhere in between. We don't know and shouldn't need to either way this fire should have some effect, but not too much. Decisive results should only be affected much closer. SO, I've been tinkering with hits and morale and numbers of dice and so on, looking for an equivalent for the 1 or 2 hits on a 48 man unit when using 4 hit units. A few years ago I was playing around with a disorder result and am beginning to think that I need to revisit that keeping in the mind that I am NOT going to track more than 1 marker for status and 1 for permanent reduction of morale/casualties. 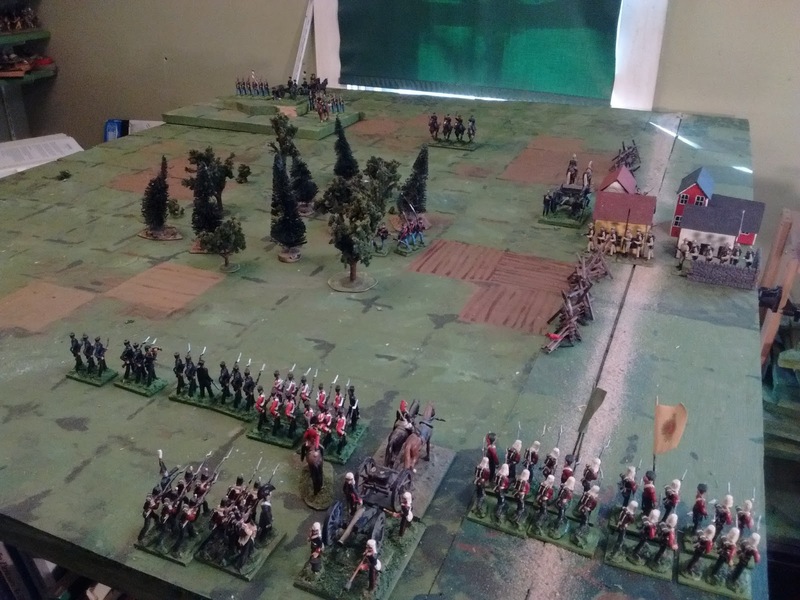 Apart from such details, its all lights green, there will be more minor tinkering but I know what I am looking for now and the pattern of the rules is set, the organization of the armies is set and recruiting and dressing the troops in full swing. Now if I could just have a few days to devote to the hobby instead of so called 'real life'! The current goal is to have the back ground write up prepared and the first of a series of mini campaigns or at least battles ready to go by March. So....back to work! This afternoon I fired up my melting pot and cast up the 2nd batch of Canadian volunteers. This time, keeping in mind the soft nature of the rubber used for the mold, I used elastics instead of my usual spring clamps to hold the mold together. The first one out was less than satisfactory but I adjusted the elastics and 10 good castings followed. plop, plop, plop, Of course I just realized I'll need 2 more to complete the 2nd unit but that shouldn't be a problem. The 2nd round of recruiting. I haven't had a chance to play out the game but have grabbed a few minutes to play a turn here and there and soon realized that I was even more unsettled than I thought about what sort of feel that I want for this proposed central focus for my gaming and collecting over the next 5 years. 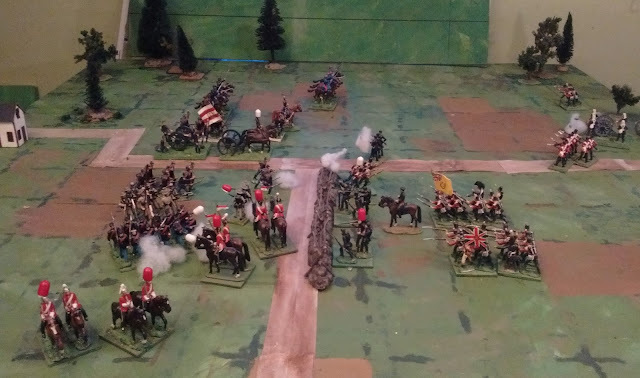 It didn't help that I've been reading some detailed accounts of the skirmish at Ridgeway and looking at some blog battle reports of good, old fashioned tactical games. So I wavered a bit and tried this and that, adding some detail to units and combat, playing with sequences, morale etc etc. Just enough to eventually reassure my self that I was way off course and that the rules and approach used in the recent PBEM. game are much closer to what I want going forward. So The Model Major General it is. Tomorrow or Friday I will reset and take it from the top. Sometimes is not easy getting volunteers in shape. Now my room at the back of the house is sometimes a bit chilly this time of year so I often wear an old cardigan with the baggy sleeves cut off to avoid snagging soldiers and hurling them across the room when leaning over the games table. Apparently, even with the sleeves cut off the mischievous thing is still quite capable of snagging a stick full of 1/2 painted figures and hurling them to the floor. OK then 4 privates. Carry on, I'll just have to add 4 more instead of 3. Then I looked at the officer, one of my 1840's officer castings whose peaked cap I had filed down and squared up into an 1860's officer's cap, sort of. Something tickled the back of my brain, so after a few seconds I reached for the reference books again. Yup, I was right. Prior to the Crimean War British officers wore a waist sash, often knotted on the left, and so did my figure. However, after Crimea, it was replaced by a shoulder sash knotted on the left for sergeants but on the right for officers. C**P! I briefly thought about the old Britain's approach of "if its not painted it isn't there" but I had over exaggerated the sculpting of the knot and there was no way I could ignore it. Then I thought, maybe sergeant-majors were allowed to wear officer style frock coats? Six books later with more to go, I decided that answering the question was going to involve a long search, possibly years and wasn't likely to be found in my library, filing off the offending lump of metal would be faster even if it did take the paint off the nearly finished figure. Sighhh. All better now. Time to get them into action. In between painting and life, I've been trying to "wrassle" the wreck of several aborted armies back into what they were originally supposed to be, organized for the rules in hand. Along the way I was reminded that the organization and basing scheme is what was decided on 2 years ago, just before the unexpected outbreak of the Great War on my table top. An outbreak that seemed to disrupt everything for a year and 1/2. I also noted that for the 3rd time in 5 years, I have come back to a 40mm version of my original 54mm plan from 1999. Third time is a charm 'they' say. Its often a good idea when testing to start small and simple so I have set up a very basic, as Old School as it gets, meeting engagement between equal forces. 2 cavalry squadrons, 16 infantry companies and 1 gun a side. "Take and hold the crossroad". About as traditional a basic set up and scenario as you can get. Report probably on Tuesday. If all goes well it'll be time for some campaigning. It begins with a village dance then mobilization, the declaration, some preliminary Russo Turkish action and then settles into Plevna and shows the Romanians tipping the balance and ends with a 30th anniversay parade. The acting and cinematography is what you would expect or better for 1912 and someone has kindly translated the captions. There are scads of soldiers in period uniforms who seem to know what they are about, I suspect they were either serving soldiers on loan or else included a lot of veterans and reservists. The film also included shots of field hospitals and at least 1 band, reminding me that those rules need to be ported over fron Hearts of Tin. If you have any interest in the late 19thC its well worth an hour and a half. Pity its not in colour! I haven't got my room tidied up yet or the dark sloped wall/ceiling beneath the eaves painted bright white but I've finished the butternot Oerberg battalion and the rest of the Belmont Rifles have been cast and primed. 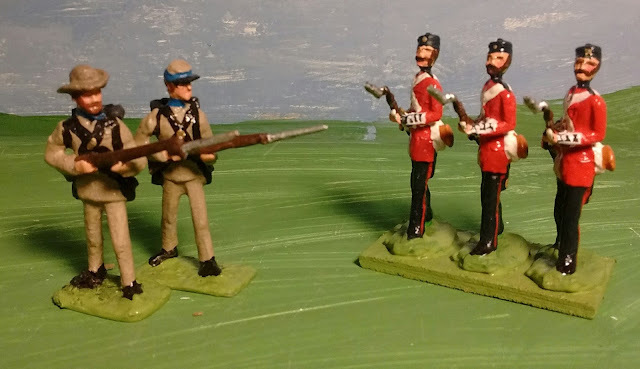 I have also spent time rebasing for consistency and flexibility rather than need and fiddling with the rules and contemplating how best to justify having ACW and contemporary British & fictional troops in both 1/72nd & 40mm. The obvious answer of fighting bigger battles with the smaller figures only had 1 small snag. Both use the same organization, same rules, and can fit the same number of units on the table at 1 per grid. Ignoring that, I intend to fight mostly smaller actions with the 40's but as was always the case with MacDuff, the larger games will be the same as small games of the bigger battle collection but I can live with that since I already have the 1/72nd and so many of the 40's. A Modified Model Major General will be used for the 1/72 ACW games with the same basic structure but angled to make bigger games faster and easier. 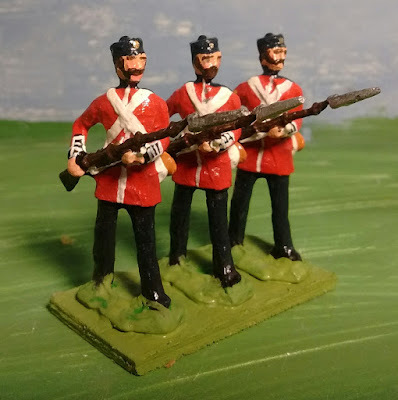 After much tweaking and untweaking and some reflection, the rules for the 40mm games will bear the Square Brigadier name since the name well is dry and it shares the basic concepts, play sequence etc. An untested draft under the name Square Brigadier 2016 The Tin Army can be found under links or here. Organizing and painting continues with plans for a solo test by the weekend. Should be ready to think about PBEM after that if all goes well. Prince Valiant 40mm Elastolin fictional dark age. Not Quite the Seven Years War. PA homecast semiflats and Charge! Old Soldiers. 54mm vintage Britains + compatible figures, NW Rebellion + NQ Zulus. The first company of Belmont Rifles. I took my 3 test castings, cleaned them up and applied paint. Not exactly professional sculpting or mold making but I'm pretty pleased with them overall. A little rough but gloss paint and numbers will deflect the eye. I'll hopefully get the next 9 cast tomorrow followed later by 2 more units, 1 red, 1 rifle green. The original plan then calls for me to rework the master to add a low shako and pack and make a new mold. 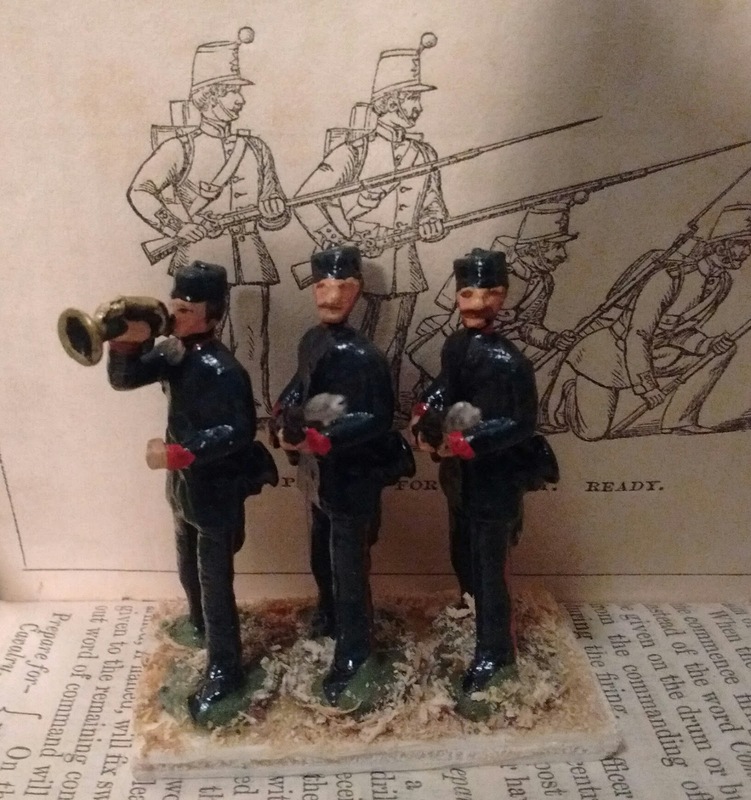 At the same time, I took action to back date my unit of 8 x 1900 Oerberg infantry in drab uniforms to 12 x 1860 ones wearing faded homespun uniforms. 2 samples done, the rest nearly done. 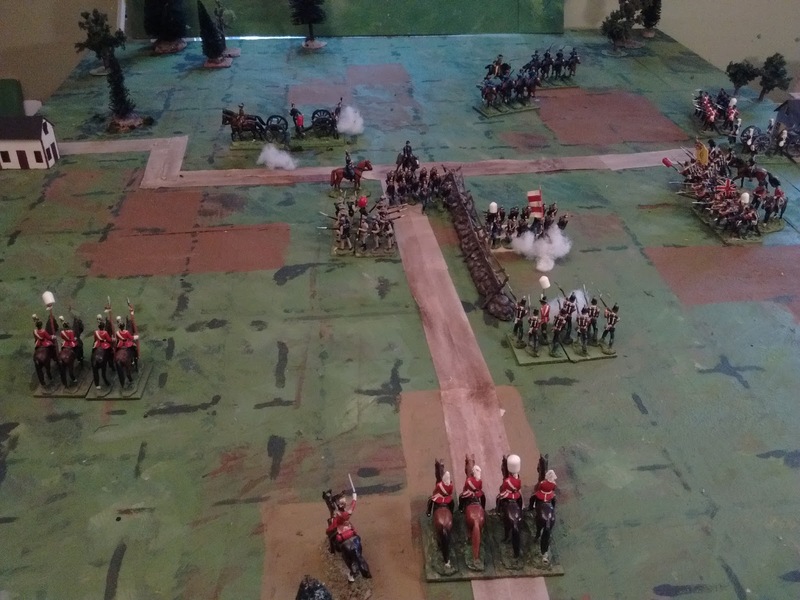 Mounted rifles to finally follow ere long and a game after. Scruby 40mm ACW vs homemade. Nowhere to go but lots to do. 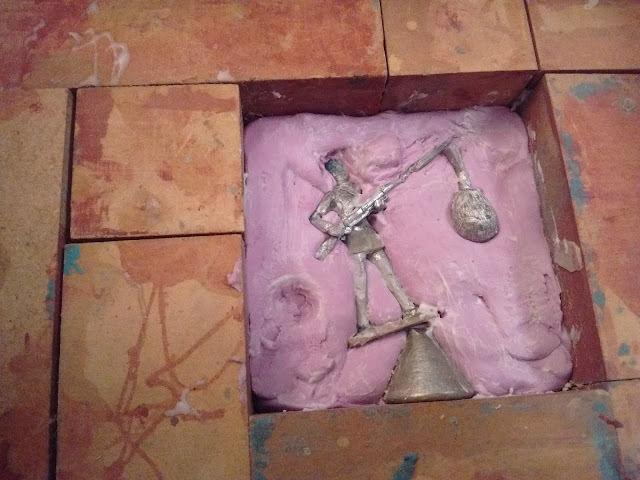 It was 2013 that I first attempted to make a mold of this 1860's Canadian militia private, a mold which I flubbed. Its hard to believe its taken this long to get back at him but I've been floundering around trying to decide just which period I'm doing anyway. It didn't really help when the Great War broke out on my tabletop. Anyway........after some tense moments when the fate of the battle lay in a handful of dice, the PBEM Battle of Rushville is over. The view 1/2 way through the 2nd last turn when it became obvious that Blue no longer had enough time or men to take the objective. Running the game was a great deal of fun and I'm looking forward to the next one. I have to take a break for a week or two first though to get some prep work done as well as doing some work on my room itself now that the table is settled. So, more on that later. 1st casting on the left, a qualified success. There is a bit of pitting, loss of detail, some flash and some ugly mold lines but I've done worse. Luckily, once cleaned up, they'll be painted in glossy toy style, not shaded with washes. Quite apart from the PBEM aspects, this last game put me in mind of a "traditional wargame" rather than a "cardtable game". I think some part of me had forgotten that I still like both. The scenario (was I too subtle in having Sam Elliot commanding the skirmish line with superior fire power which defended the ridge with the College (or Seminary?) also reminded me that the period from the Crimean War through the Mutiny and ACW, the era of transition from musket to rifle,from Napoleonic to modern, is my favorite to read about or to put on the table as well as having my favourite uniforms. Lastly the game reminded me why I've been trying for a few years now to elevate one single period (almost any period) to a Majority position so I can run some campaigns with some consistency leaving the rest as occasional diversions. I wonder sometimes at the faulty logic which has several times aborted my focus on this period but..... try, try again. 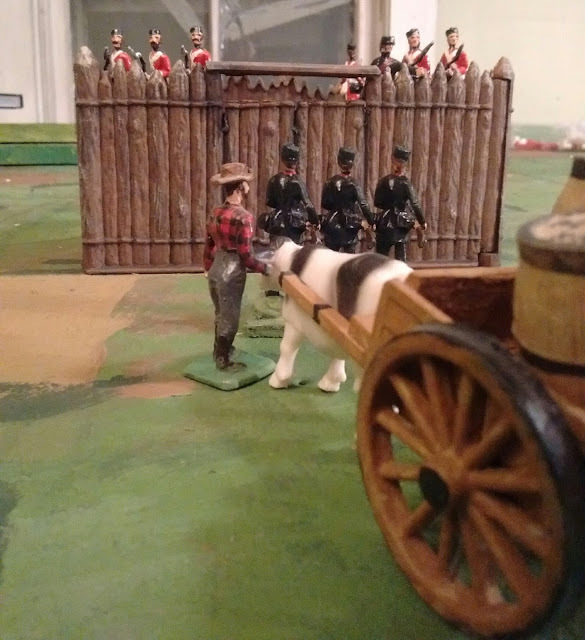 This will mean overlap with the 1/72 historical ACW and near overlap with the Riel Rebellion (the Canadians were still wearing the same uniforms and the SniderEnfield conversion), but, well, they're slightly different games and anyway they all already exist. So the plan is broadly the same but once again Atlantica in the 1850's and 60s will again be my focus and will include the Oerberg War and some Colonial style games. The WW1 collection will eventually have the British brought up to strength but that will be it and there will be no 40's inbetween the two. Nor will there be any earlier Atlantica armies. As per an earlier plan my coatee and shako lads will provide a small Victorian lithograph version of the War of 1812. 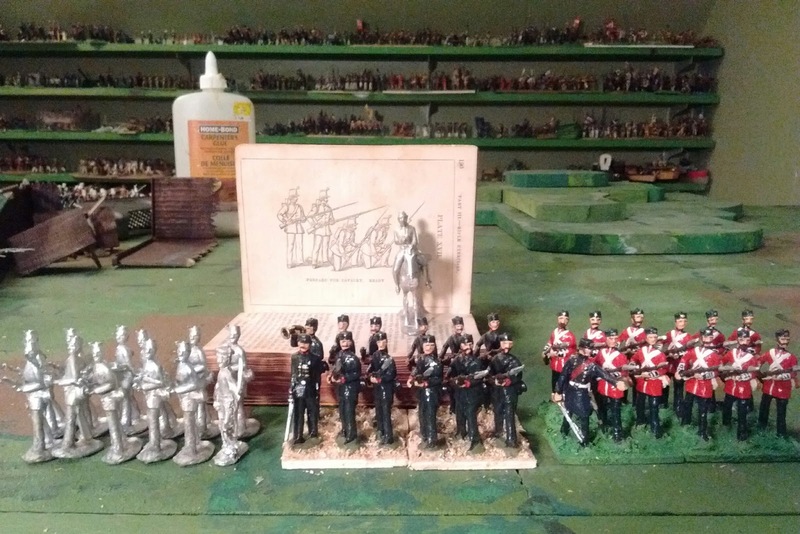 Faraway's armies are in sad need of troops for my chosen era hence the mold as a start, but Oberhilse just needs a few figures here and there, some touch ups and a coherent basing system and they are ready to take the field with 12 battalions of infantry plus guns and cavalry.